La atracción abrió nuevamente en 2016 con nuevos efectos especiales. Una atracción muy original ubicada dentro de DinoLand U.S.A., DINOSAUR permite que viajes 65 millones de regreso en el tiempo y te encuentre cara a cara con una variedad de amenazantes criaturas prehistoricas. Start your adventure by wandering through the Dino Institute, which offers a number of informative exhibits and multimedia shows that detail the time when dinosaurs roamed the earth. Then hop into one of the 12-passenger, all-terrain vehicles that will take you back in time on your DINOSAUR adventure as you search for the elusive Iguanodon. 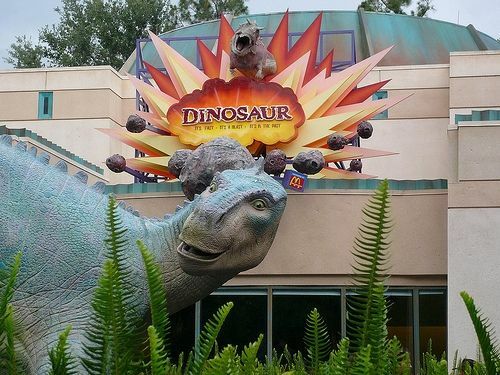 The DINOSAUR ride itself, which was originally known as Countdown to Extinction, features some of the largest audio-animatronic figures ever created at Walt Disney World and lasts approximately 3 minutes. Height Requirement: You must be at least 40 inches tall to experience DINOSAUR. Also, make sure to check out the health restrictions posted at the entrance to the thrill ride. Some scenes during the DINOSAUR adventure may be too intense for children. Photos of your DINOSAUR experience can be purchased at the exit of the ride. ¿Cual es Mejor?...¿Disney Springs o Universal CityWalk?